We focus on the search of the coming day. Early tonight, we overcame the dune belt that separates the sand fields from the open plain. 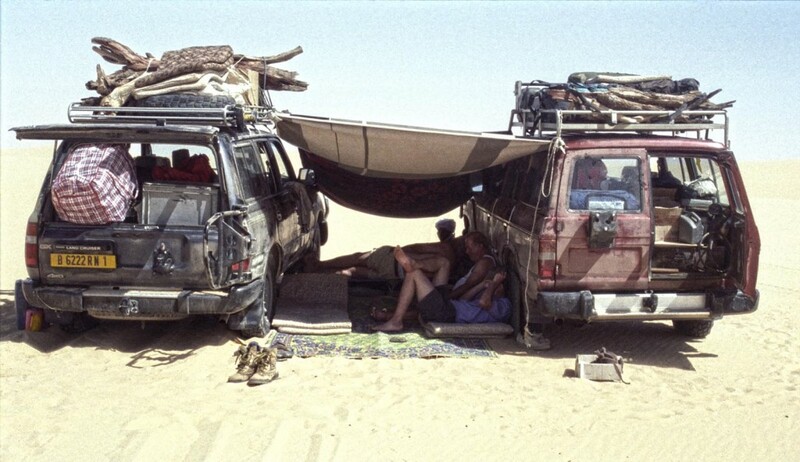 Before us lies the borderless flat of Ténéré Tafassasset. Here, single meteorite finds occured sporadicly over the past years. Mostly the finds were reported to geologists in Niamey by local guides who collected the strange black rocks and questioned about their origin. But also European desert enthusiasts made finds. In both cases the precious information about the finding situation such as coordinates, geological data of soil and the surrounding is usually lost. After the stone has passed a few hands, the data is no longer reconstructable. But the hope for alleged astronomical profits drives an increasing number of people into the search for the "Tekack", the "thunderstones", as the Tuareg call them. We focus on the search of the coming day. 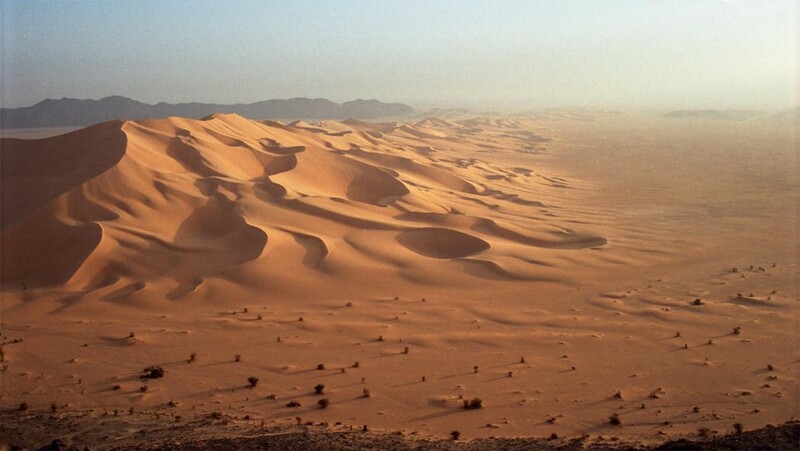 Early tonight, we overcame the dune belt that separates the sand fields from the open plain. Before us lies the borderless flat of Ténéré Tafassasset. Here, single meteorite finds occured sporadicly over the past years. Mostly the finds were reported to geologists in Niamey by local guides who collected the strange black rocks and questioned about their origin. But also European desert enthusiasts made finds. In both cases the precious information about the finding situation such as coordinates, geological data of soil and the surrounding is usually lost. After the stone has passed a few hands, the data is no longer reconstructable. But the hope for alleged astronomical profits drives an increasing number of people into the search for the “Tekack”, the “thunderstones”, as the Tuareg call them. 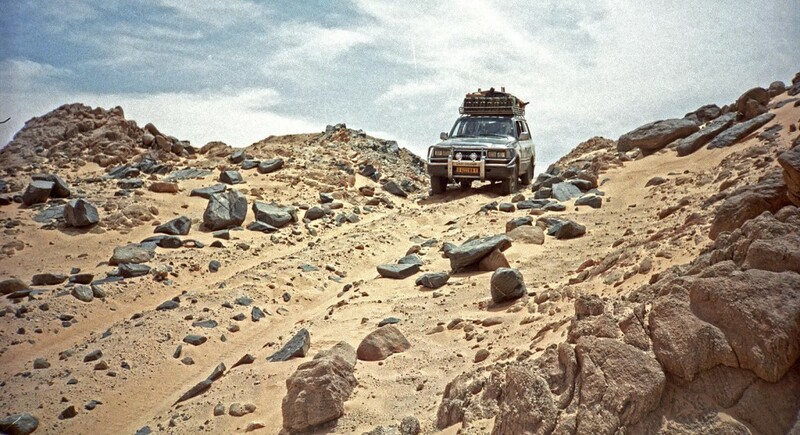 Viewed from a financial perspective, a weathered medium sized chondrite, of which literally truckloads have been found in the Moroccan and Algerian deserts, is not worth the fuel that is spent on the journey to a remote strewfield. That remains true even if one takes North African fuel prices as a scale. The prospect of the one in a million find, a Martian or a Lunar Meteorite, leads to undue expectations that can only be realized in the scarcest cases. During our expedition temperatures in the shade never exceeded 118°F. But at midday in August the air in the Ténéré heats up to a grim 130°F. The first two days in the Ténéré Tafassasset we have to exercise ourselfes in endurance. We check hundreds of odd rocks that catch our attention, non of them reveal as a meteorite. Quite frequently we have to navigate through vast fields of fech fech, deep powdery gypsum deposits, often hidden under a treacherous blanket of sand. If we spot a rock here we have to jump out of the car and walk a few hundred yards while the Driver continues, since the vehicle can’t be stopped on the soft soild without running the risk to get stuck. If he’d stop, we would sink to the axles on the attempt to start again. For the untrained eye, scanning the featureless terrain is extremely exhausting. There are no objects the jaded eyes can hold on to. Nothing but an endless looming gravel plain passing by monotonously. Bizarre mirages transform far away pebbles into huge boulders but coming closer they shrink to their natural size as if they were objects of an evil charme. It’s around noon, the thermometer is at 115°F. In the blinding white heat, even larger debris on the surface is invisible now. No shaddow that silhouettes the rocks from the fawn monochrome of the desert pavement. Time for the camp. A tarpolin strechted over the two cars provides the shaddow saving us from the sunstroke that would be inevitable outside the protective cage of the vehicle. Elkontchi tells an odd story of a caravan leader who seperated from his men to scout an unexplored mountain pass in the Algerian frontier area. Since he did not show up at the rendevouz point on the other side of the mountain, the carvan moved on because it was short on water. Yet, in the same night in which the companions saw their leader disappear, the completely bewildered man was taken up on a bazar in the city of Ndjamena more than 650 miles away and taken to a hospital. Semi somnolent I’m listening to Elkontchi’s story and ask myself if not maybe Elkontchi was the disoriented carvan leader and if we’re probably doomed to a similar fate. At three in the afternoon, the blistering heat settles and we continue to prospect. Although the vast flat delta of the Wadi Tafassasset seems to provide an ideal search ground, this day too appears to perish without a find. On a shallow hilltop, we stop to allow the other vehicle to close up. It got so far away that only the incredibly sharp eyes of Alhazan were just about able to spot it. Ten meters in front of our Land Cruiser, a small speck of stone, merely the size of a hazelnut, catches Souleymane’s attention. At first sight this pebble has no affinty to the meteorites I know from the museum cabinets. It is neither smoothed from its fiery passage through Earth’s atmoshere nor is it abladed by blowing sands or crusted with desert varnish like our previuos finds. Nevertheless there are fine grains of metal embedded in its charcoal colored matrix. And the grain lumps are strikingly uncommon for any terrestrial rock, at least the ones I am familiar with. “A thunderstone?” Souleymane asks. “Inschallah”, “so God will”, Aoutchiki answers. A month later, during the analysis in Hamburg, we will find out that we found a fragment of the famous Tafassasset primitive achondrite. Despite minor terrestrial oxidation, the metorite dating 4.5 billion years contains almost unaltered matter of the presolar nebulae. As a witness of the birth of our solar system it throws light on the genesis of our world. At the day of our return to Agadez, a tall Tuareg who camps in the dunes outside the city visits me. He is well informed about our mission. News spread quickly among the desert nomads. He introduces himself as Abu Selima and wants to serve us as a guide to a very special place. What he reports reminds me on the chimerical story of Emir Mûsa’s quest for the City of Brass. A legend from the Book of Treasures, which must be considered among the most inspiring expedition reports ever written. Abu Selima embellishes his story well and truly, but the landmarks he mentions, especially his naive geologial descriptions of them, rouses our curiousity. We encourage him to continue. Even though Abu Selima’s information will barely withtstand a verification by proper sciences, he receives an engagement for next year’s expedition. Not because he promises me a Mehari, a white Taureg camel, for the journey. But rather because there is something of the lost myth of the Sahara with him that most of his enterprising colleages lack.